Commissioned by santa_elidan for belovedranger's story Season's Greetings, and the scene was chosen by members of the art_of_nook community. Ron&Hermione and Bill&Fleur's baby, Sebastien. oh wow that is beautiful! I especialylike the detail you put into this like the silhoutettes through the doorway and the (really! )twinkling of the fairy lights. Oh and lest I forget, Hermione's hand on his bum, is absolutley brilliant. I think this may be one of my favourite pieces of yours. Well done again! I want to say, "OMG! COUld it be any more perfect?" But I can't. It's a stupid question. THe answer is no, it most certainly could not. Gorgeous, just gorgeous. they look so young and lovely. I love how glowing their hair is. and their profiles are just beautiful. Leela! This looks amazing. I saw this in sketch form on art_of_nook, but it really comes alive with all the color. I just love that story. Your drawings have made it come to life for me. Beautiful! Bless! Just looking at this makes me get al holiday spirit and it's only September, so YAY!! I love the dark rich homey colors and the soft lighting. And it may totally be out of context for the original intention, but I totally looked at this and saw Hermione's expression and just giggled. She's looking at Ron like "I want one!" And Ron's all "hee hee so cu--I'msorrywhat?" Nawwwwwww! Hahaha! Well that will make santa_elidan happy, because she specifically wanted me to make Hermione look like she wanted to 'make one right now!' Heh. I love Sebastien ´s face!So cute. And love Ron´s face and the Christmas tree! That's absolutely gorgeous! I love the brightness of the whole drawing. 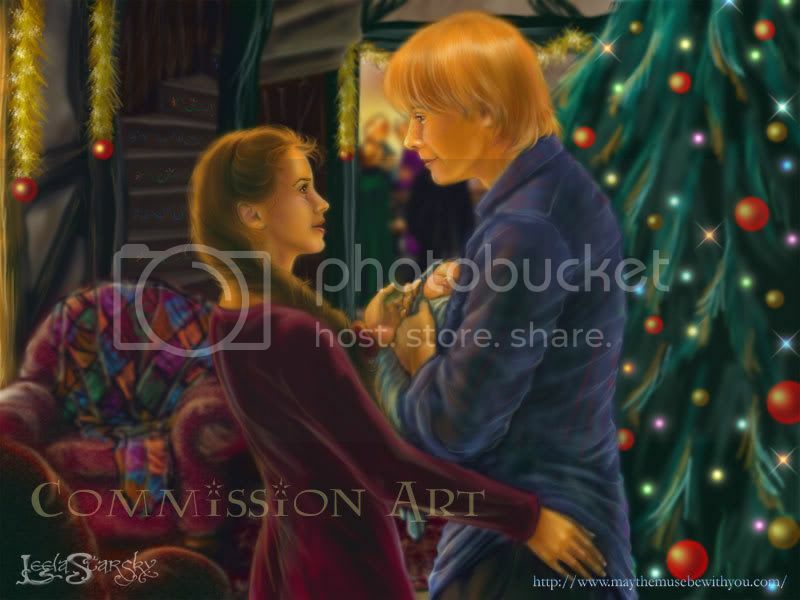 I'm drawn to every detail: the blanket on the chair, the lights in the Christmas tree, Hermione's braid, in the distance Harry (I assume) watching them, her hand on his bum, her other hands caressing Sebastian, and the the look of adoration they're given each other. It's just breathtaking. Wonderful job! Wow. This is absolutely gorgeous! I love the softness of the coloring and lighting. Hermione is beautiful, especially her hair (and I love the placement of her hands *G*). Beautiful rich colors! and that baby is adorable!